The bottle: Harrington’s Breweries range of beers look rather underwhelming, to be perfectly honest with you. Stacked on the supermarket shelf alongside much more striking offerings from the likes of Bach Brewing, Garage Project, and Liberty (probably the top three Kiwi craft breweries with the best beer labels), Harrington’s range of beers look a bit, well, naff. Still, you mustn’t judge a beer by its label – unless you take one look at these bottles of beer and assume they’re cheap, in which case you’d be correct. They are considerably cheaper than the usual crafties, with a 500ml bottle retailing for around the $6 mark. So, shopping for a bargain because I’ve been spending quite a lot on beer lately, I decided to pick up a bottle of Harrington’s classiest offering: The Classy Red extra special bitter. Blurb on the bottle: Full of rich malt flavour harmonised with 5 hop varieties, infused using our “Hop Back” method. Absolutely delicious! A complex wee treat for the palate and very classy. Who? Established in 1991, Harrington’s is a family-owned brewery that’s based on Ferry Road, Christchurch. I’ve tried their stuff before – about ten years ago when I lived down there in the Garden City – but that was a lifetime ago in terms of my enjoyment of beer. I mean, I probably thought Tui was a good beer back then (I was young and stupid; please don’t hold it against me!). Tastes like: A hidden gem. This amber ale boasts a surprisingly subtle fruity-hoppy aroma, and smacks of caramel and burnt toffee, with a lovely grassy bitterness. It’s deceptively hoppy, with a medium body, with an ever-so-slightly velvety mouthfeel and a moderate white head. But the Classy Red isn’t all sweetness and bitterness. It’d be well at home on tap at a proper English pub. Is it the best beer ever? The Classy Red is a pleasant surprise. 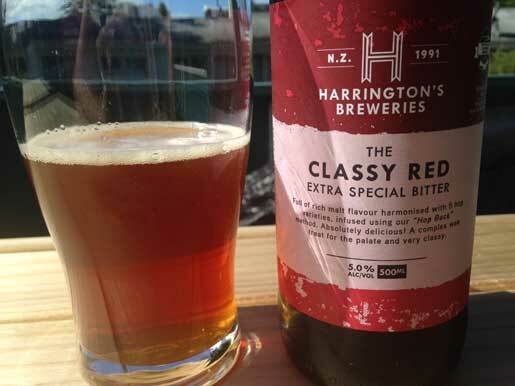 In this price range – around the $6 mark – Harrington’s Classy Red extra special bitter would likely be one of my top picks for a solid craft beer to see in the afternoon with.